Last week I was fortunate enough to attend training for a new voluntary post to get people talking about the big ‘C’. Three experts in bowel, breast and lung cancer shared with us the surprising news that if diagnosed early, 8 out of 10 people survive bowel cancer and 9 out of 10 people survive breast cancer. Critical to an early diagnosis is ensuring that people recognise the symptoms and act swiftly by going to their GP. My role as a volunteer will involve meeting with community groups to share information on the symptoms. Perhaps our most important community marketing campaign yet…If you know of a Staffordshire based group aged 40+ who would be willing to listen to a ten minute chat, do get in touch. 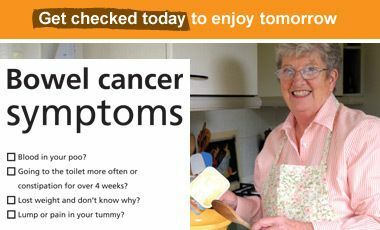 If you’re further afield, please check out the website and familiarise yourself with the symptoms.